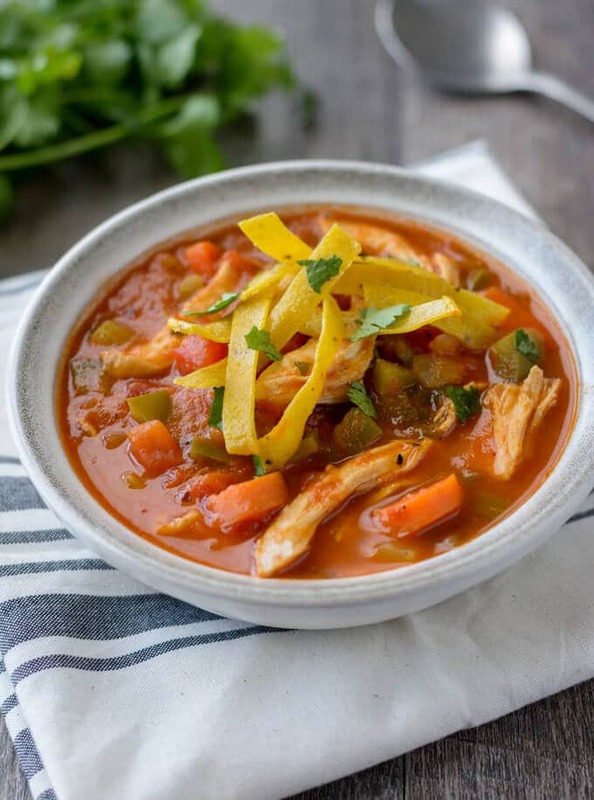 This healthy Mexican Chicken Soup is a delicious and hearty soup recipe. It’s made with juicy and tender shredded chicken and loaded with veggies. Top it off with your favorite garnishes for a tasty meal! 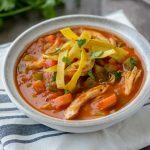 This recipe is inspired by Ina Garten’s Mexican Chicken Soup recipe in her Barefoot Contessa at Home cookbook. She likes to roast her chicken breast bone-in and skin-on for her recipes because it helps keep it moist and delicious. And boy does it! So much more flavor with bone-in, skin-on chicken. And it’s not hard at all. Worth a little extra effort for deliciously moist chicken. Of course, if you need a quick weeknight meal, you could always pick up a rotisserie chicken from the store and use that instead. Roast the split chicken breasts in the oven until done. Let cool, remove from the bone and shred. Meanwhile, saute veggies and add spices. Then, stir in the tomatoes and chicken stock. Let simmer for twenty-five minutes, then add the shredded chicken to the pot. I topped mine with some baked corn tortilla strips, but you could always use some crushed tortilla chips. I liked it fine with just that as a topping, but a dollop of sour cream, some diced avocado or grated Monterey Jack cheese would also be great. You could also serve this with rice. Homemade chicken stock or a good quality store-bought one like Imagine Organic is best for this recipe. It adds a depth of flavor that you need in a soup like this. 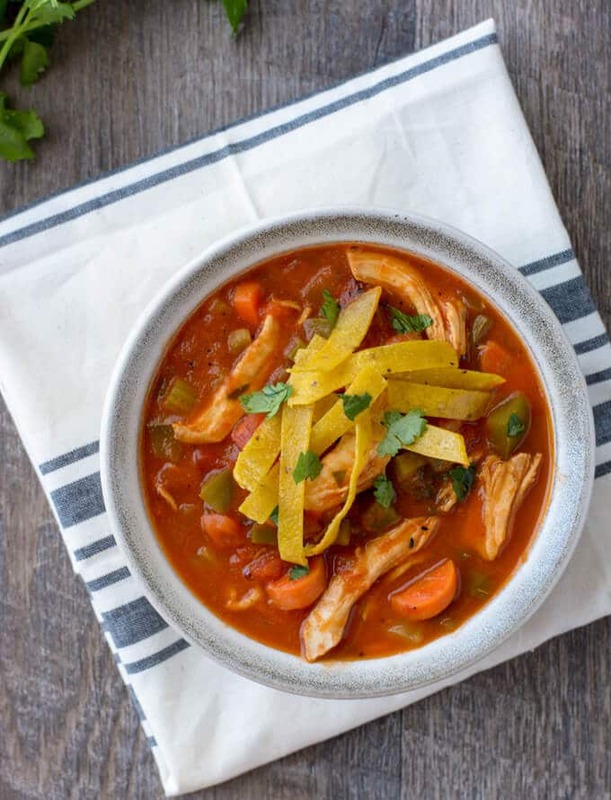 Save this Mexican Chicken Soup Recipe to your “Soups” Pinterest board! A delicious and hearty soup made with shredded chicken, peppers and tomatoes. Serve it with your choice of toppings. While the chicken is cooling, heat two tablespoons of oil in a 4 or 5-quart dutch oven or soup pot over medium-low heat. Add the onions, celery, carrots and bell pepper to the pot and let cook for 10 minutes, stirring occasionally. Stir in the garlic and spices and let cook for an additional minute. Pour in the chicken stock and tomatoes. Add the sea salt and cilantro and stir to combine. Bring the soup to a boil, then reduce the heat and let simmer for about 25 minutes. Add the shredded chicken to the pot and stir. Check seasonings and adjust if necessary. Serve topped with a dollop of sour cream, crushed tortilla chips, or sliced avocado. 1.No time to roast your own chicken? Pick up a rotisserie chicken from the store and shred that instead! 2.To make your own tortilla strips, you will need 5 (6-inch) corn tortillas. Cut them in half, then into 1/2-inch wide strips. A pair of kitchen shears works great for this. Once the chicken comes out of the oven, raise the heat to 425°F. Place the tortilla strips on a large baking sheet, drizzle with oil and toss until they are evenly coated. Spread them out on the baking sheet and sprinkle with sea salt. Place into oven and bake until crispy and golden brown, about 12-14 minutes, rotating the pan and shaking the strips to redistribute about halfway through the bake time. Remove from the oven and transfer to a paper towel-lined plate. That looks soooo good! My kids love chicken soup so much. Can’t wait to make this for them. Thanks for sharing! Thank you! Hope you all enjoy it!